Surrey NanoSystems, the U.K. company that makes Vantablack, describes it as "a functionalised 'forest' of millions upon millions of incredibly small tubes made of carbon, or carbon nanotubes." First, it's not really black. It's not even a color or a pigment. "Vantablack" is a "material," according to Surrey NanoSystems, the British company that created it. But this growling, rebellious material is causing quite a fuss now that renowned sculptor Anish Kapoor — who designed Chicago's Cloud Gate and the Orbit tower for the 2012 London Olympics — has bought the exclusive rights to use it in art. If you want the official explanation of what Vantablack is, check out the company's FAQ. We prefer Hyperallergic's description of "the blackest black out there." Writer Claire Voon calls Vantablack "much blacker than a panther swimming in a tarpit, the Ayam Cemami, or your wardrobe during your middle school goth phase." 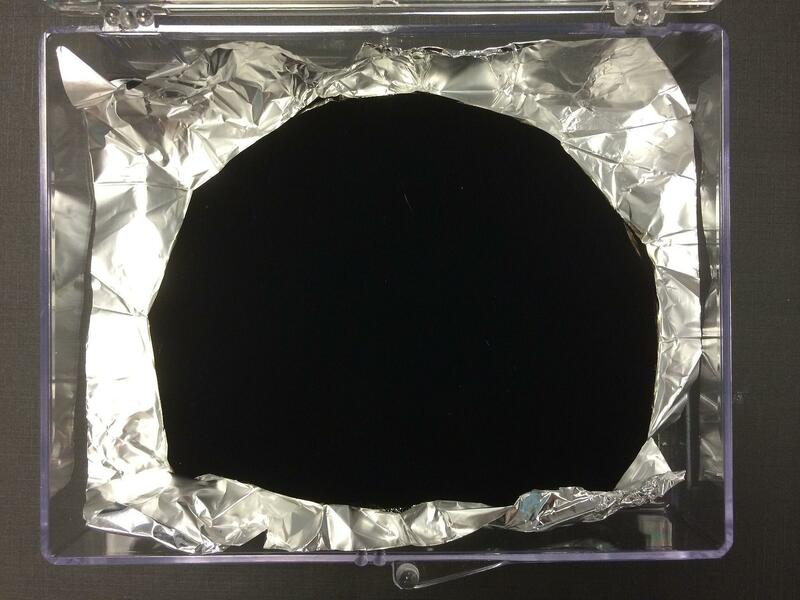 Surrey NanoSystems says Vantablack also has light-reducing properties that make it useful for things like high-performance infrared cameras and scientific equipment. The criticism against Kapoor's ownership has been harsh. "Immoral," tweeted Carolyn Black, founder of Flow Contemporary Arts. Artist Christian Furr explained his outrage to The Daily Mail: "All the best artists have had a thing for pure black — Turner, Manet, Goya. This black is like dynamite in the art world. We should be able to use it. It isn't right that it belongs to one man." Unfortunately for Furr and other artists, Surrey NanoSystems invented the process to create Vantablack and can sell the results of that process to whomever it wants. The company's website states that Kapoor's "exclusive licence limits the coating's use in the field of art, but does not extend to any other sectors." Cardozo law professor Christopher J. Buccafusco, who specializes in art law, copyright and intellectual property, understands the anger. "It's a weird situation. People intuitively feel that it's anticompetitive and immoral, but this sort of thing is intellectual property. When people invent stuff that's new they get to have exclusive control over it. Often we think that's a good thing." Buccafusco also recommends putting this in perspective. "It sounds worse than it really is. This is not like someone owning B flat." A spokesperson for Surrey NanoSystems says the company doesn't want to engage in disputes between artists and that it's trying to correct misunderstandings about Vantablack. For starters, it's not a paint or a pigment as some media outlets have reported. The company also questions whether it's well-suited to art. Vantablack, according to the company's website, "requires specialist application to achieve its aesthetic effect. In addition, the coating's performance beyond the visible spectrum results in it being classified as a dual-use material that is subject to UK Export Control. We have therefore chosen to license Vantablack S-VIS exclusively to Kapoor Studios UK to explore its use in works of art." Back to the poetry of this non-color named Vantablack. As Kapoor told the BBC, "Imagine a space that's so dark that as you walk in you lose all sense of where you are, what you are, and especially all sense of time."